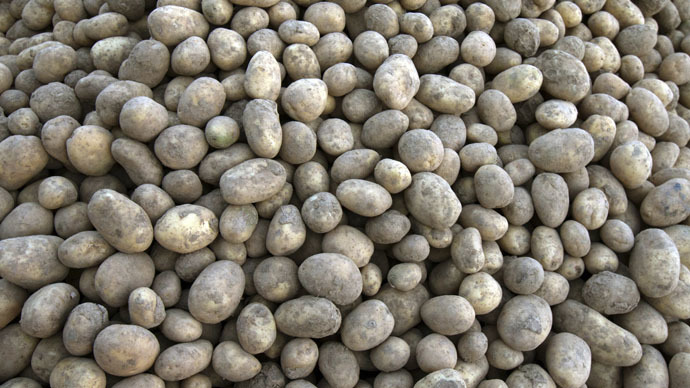 Created by the J. R. Simplot Company, ‘Innate’ potatoes were created by inserting extra genes into them – genes that are modified but that otherwise exist naturally in the potato. Through genetic modification using RNA interference (RNAi), scientists used these genes to shut down a few of the potato’s other original genes – a process called gene silencing. Some of the genes being shut down are those that cause bruising and create acrylamide when potatoes are baked or fried. Acrylamide is an amino acid which, in tests conducted on rats, has increased the animals’ risk of getting cancer. There are also financial incentives behind gene silencing, and the Innate potato was designed to solve a big monetary problem. Farmers currently throw out 1.4 billion pounds of potatoes due to browning and bruising, costing them 15 percent of their profits each year. The fewer potatoes thrown out because of this, the more profit they can recoup off their yield. While the US Department of Agriculture (USDA) approved the new varieties in November, the Food and Drug Administration (FDA) has yet to give the green light on the potato. It is looking into how the genetic modification has altered the chemical makeup of the potato, and whether that raises safety concerns. The Center for Food Safety (CFS) is worried about the USDA granting the Innate potato a non-regulatory status, since GMO foods are not required to be labeled. As a result, the new potato will be sold to consumers without their knowledge. CFS said gene silencing may end up turning down – or off – genes other than those that are targeted, because many genes contain similar, or even identical, stretches of DNA. Current testing cannot detect such effects. Meanwhile, RT correspondent Lindsay France reported that Simplot has conducted 140 field trials in 15 potato-growing states, as well as Canada. Still, there is other dissent coming from food manufacturers. Frito-Lay, the biggest potato chip maker, and McDonald’s have both issued statement saying they are not planning to use the Simplot potatoes in their products.